Beyonce Knowles is famous for being a singer, songwriter actress, fashion designer and has a range of fragrances. Beyonce started off with Destiny's Child in the 1990's before going onto solo success. She is bringing her class and style to a fragrance. 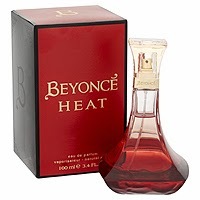 Heat by Beyonce is a feminine, floral fragrance with notes of magnolia, neroli, red vanilla orchard, peach, musk and amber. The bottle's curvaceously rounded base narrows to a sleek, squared neck and the red gradient effect gives the impression of a fire burning within. For the optimum touch of luxury, the top of the bottle is edged with a gold band, inscribed with the words 'Beyonce' and 'Heat' and topped with an opulent cap. Top notes: red vanilla orchid, neroli orpur, magnolia delavayi and blush peach. Heart notes: honeysuckle nectar, almond macaroon and creme de musk. Base notes: giant sequoia milkwood, Tonka bean and amber.